If you have any questions or want to enquire about dates, use our form to contact Ina Fumarola or see their website for more information. A winding drive though an ancient landscape of small fields and olives trees brings you to this place. It is tranquil, magical, enchanting, and Ina and Alessandro, who live ten minutes down the road, greet you warmly, in English. 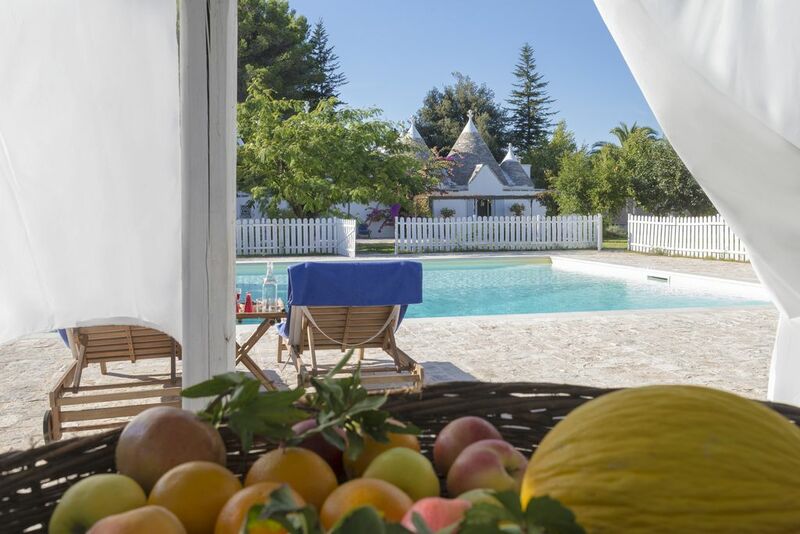 Both villa (new) and trullo (old) are one storey, and you can’t help but fall in love with the trullo; in Alessandro’s family since the 1860s, it has been brought back most beautifully to life. In whitewashed nooks and crannies are ceramics and candles, whimsical photos of donkeys, books for guests to enjoy. Linens are crisp, pillows feather, and bathrooms contemporary and delicious. The villa, designed to harmonise with the local textures and colours, is equally rustic and charming. The kitchens are a joy, and if the cooks fancy a night off, there’s a trattoria a ten-minute walk away. Outside: cherry trees, pomegranates, lavender, rosemary, mature pines behind, and a 500-year-old olive tree next to the pool. No expense has been spared, from the barbecue to the pool, to the porch with a glass roof and bamboo shading. Heavenly. We travelled as 2 families and the trullo and lamia were perfectly set-up to cater for us all. Everything was really well maintained and functional. The beds were confortable and the whole property was spotless. We loved the chill out lounge room in the lamia, which is where we would all start and finish our days. The master bathroom in the lamia was fabulous. The pool was huge and the gardens well kept. We used both the outdoor eating areas on several occasions during our stay. Ina and Sandro could not have been more helpful. It was like having a consierge on tap. Highly recommended! What a wonderful holiday we all had - our party consisted of 4 couples and 3 children and the size, layout & facilities were just perfect - light and airy and so much space - the Trulli was magical. The attention to detail was superb (many toys for the children) and our hosts Ina & Sandro could not have been more supportive and helpful. All in all a perfect place for my husbands 70th birthday celebration and we cannot wait to return. We had a wonderful stay. The main villa and trullo were perfect for two families as we each had our own space. The garden and huge pool were stunning and our children had plenty of space to play in. Both houses were very stylishly decorated. Ina and Sandro were very helpful with their recommendations and also very quick to fix any small problem. They also kindly provided toys for our children which were extremely welcome. The villa is very well located and we were able to visit many of the beautiful local towns such as Locorotondo and Ostuni. We had a wonderful stay at Trullo Fumarola - and wished we could have stayed longer! Ina & Sandro are fantastic hosts, making sure you have everything you need. Our trullo was beautiful, as was the large pool, with everything we needed along with some great toys for our 5 & 2 year old children. 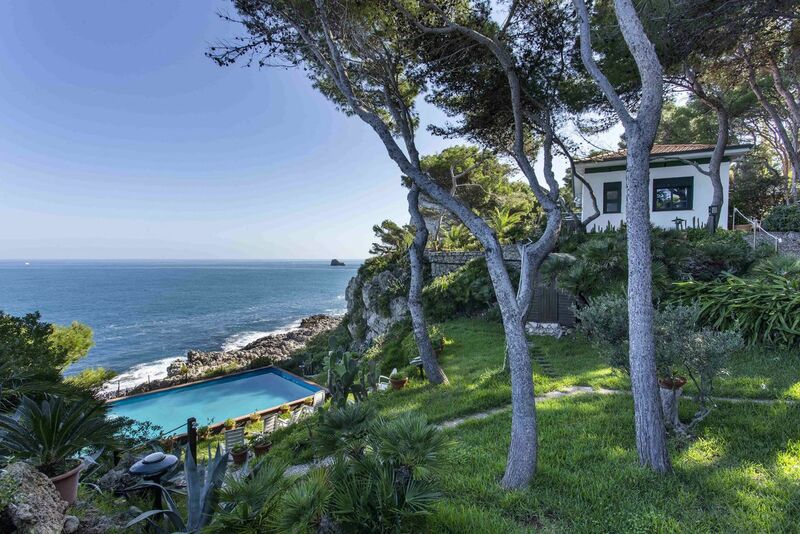 The Trullo is in a great location for exploring the local area, easy access to beaches on both coasts, and lots to do. We particularly liked the charm of Martina Franca, Locorotondo & Cisternino. We definitely plan on coming back & staying for longer too! Thanks again for a wonderful holiday! The property is a tranquil, safe and child-friendly environment, the pool is protected by a fence for maximum security. The two houses can be rented separately or together. They are detached, each one with its own surrounding space and outside dining area. We aim at making your holiday in Puglia an unforgettable experience, helping you to discover its hidden treasures. This is why we offer a variety of activities to be organized upon your request. Please write to us for more detailed information. Here are some of the activities we offer to organise for you: 1) Cookery courses, 2) Horseback riding lessons and day trips following ancient trails up to the seaside. 3) Beauty Treatments on the premises. 4) Cycling tours... and more. The nearest beach, on the Adriatic coast, is about 30 minutes by car. At about 1 hour’s drive is the Ionian coast which we definitely recommend you explore. We will be happy to supply you with directions to what we think are the best places.